The Best New Pizzeria in NYC? It is really very unusual to get excited about a new pizza place in NYC, especially one that opened on an unglamorous stretch of Queens with little fanfare. But in the last few months little Basil Brick Oven Pizza has been making a bonafide name for itself, so much so that Time Out nominated it as one of the top 5 new pizzerias in the city. I will take that claim even further, and say that if it was located in Manhattan or Brooklyn, it would have won that popularity content. Yes, it is that good. The menu offers 40(!) 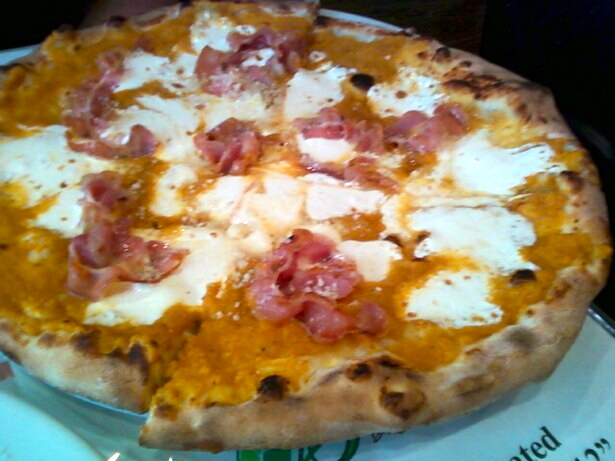 12-inch Neapolitan style pizzas from its brick oven. The creative combos go way beyond meats, veggies and Hawaiian. How about Specks & Brie or Carbonara, or two of our favorites, Herbed Pumpkin Walnut Sauce, Homemade Fresh Mozzarella, Pancetta; and Tomato Sauce, Homemade Fresh Mozzarella, Asparagus, Peas, Fresh Tomatoes and Arugula? All the ingredients are top quality with the San Marzano tomatoes, fresh vegetables, and the real difference maker, fresh homemade mozzarella cheese. 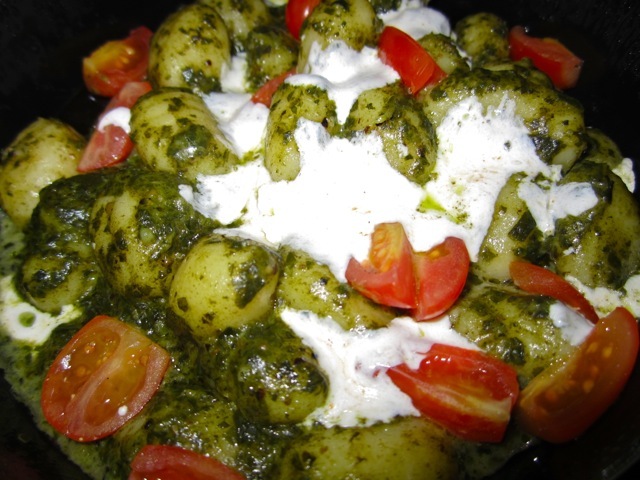 The gnocchi al pesto, one of three pasta dishes, is very good as well. But my current favorite is Il Polpettone ($9.25), Sliced Homemade Beef Meatballs, Touch of Tomato Sauce, Parmigiano Reggiano, Homemade Fresh Mozzarella & Extra Virgin Olive Oil. 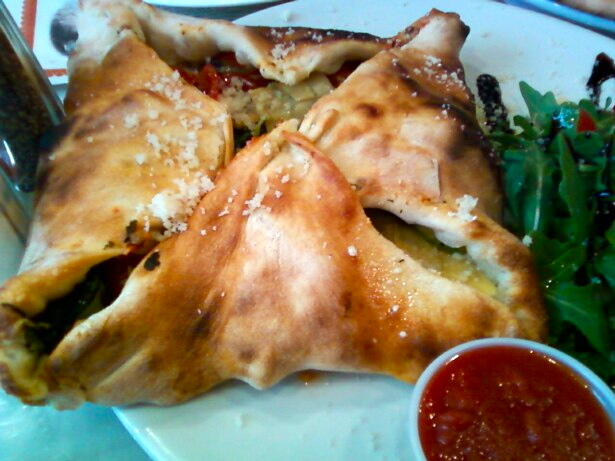 They call it a panini, but it is more like a calzone. 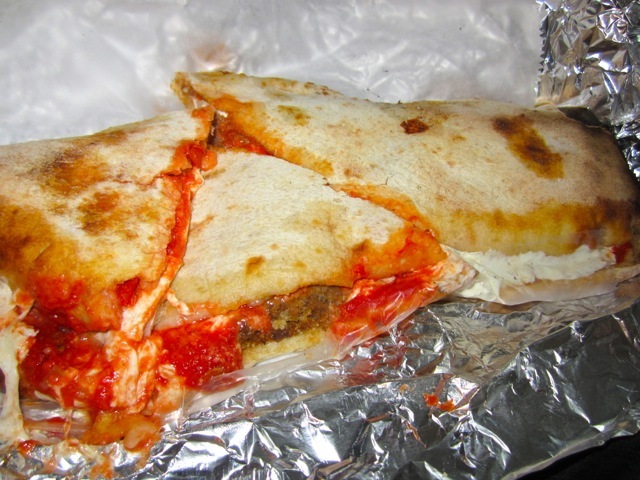 I can’t really explain why it blows me away, it is not so appealing to look at (see photo) but it must be the creaminess of the fresh cheese combined with the right balance of meat and sauce, all enveloped in slightly chewy dough. It is a masterpiece. Every single pizza here looks better than the last! 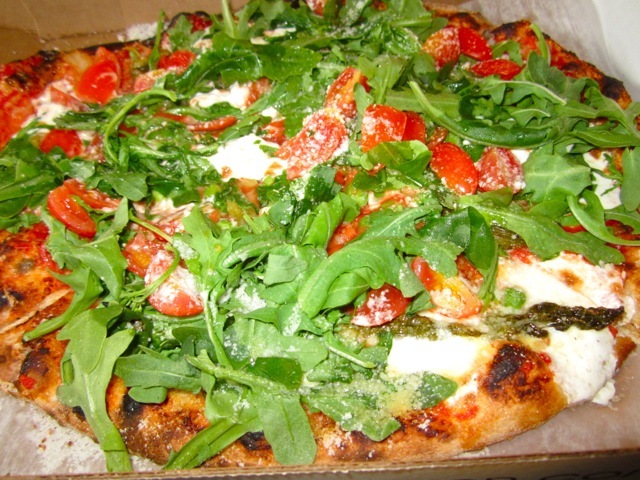 Basil Brick Oven Pizza in Astoria has been added to our list of “must try immediately!” We can hardly believe that we’ve never tried anything from there. Our mouths are watering just thinking about it.